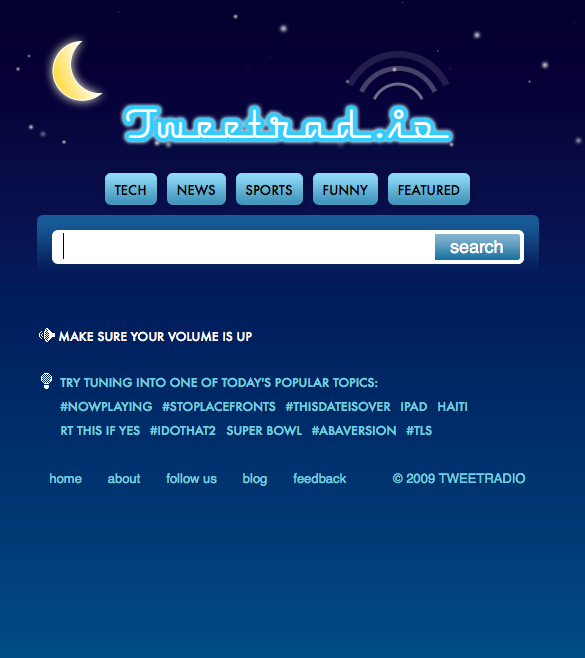 An interesting new Twitter driven service called TweetRad.io has launched. The service converts Tweets for any Twitter related topic into a voice transcript “spoken” by a computer. While TweetRad.io’s text to voice translation service is far from perfect, it sounds comparable to other text to voice translation services I have heard. Text to voice transcription quality from services like TweetRad.io will continue to progress in lockstep with Moore’s law as computing power and services continue their migration to the cloud. 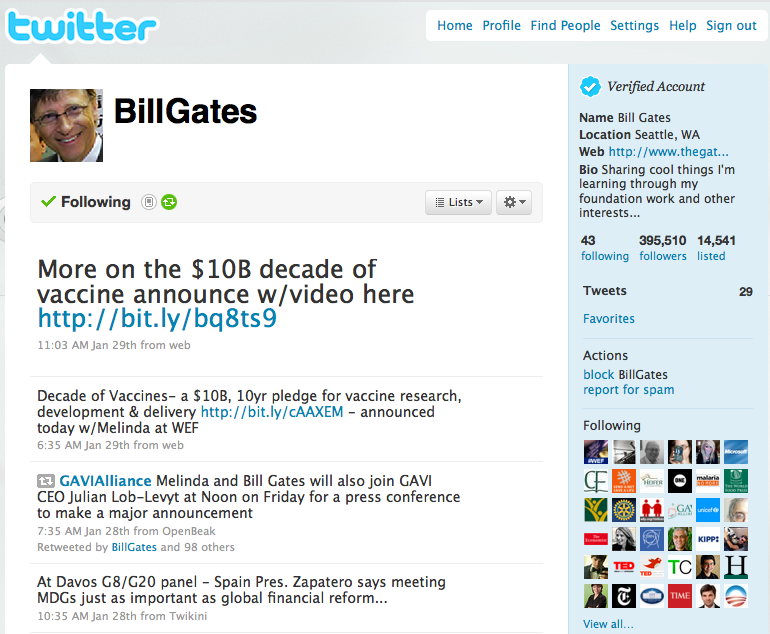 Bill Gates recently launched a Twitter account and began tweeting his thoughts to the masses. Like the majority of Twitter account holders, Gates uses the Bit.ly URL shortener to Tweet web pages addresses too long for inclusion along with his Tweets. Mr. Gates apparently still isn’t aware of his old company Microsoft’s recently launched URL shortener – Binged.it. You’d think if we was aware of it, he would be using it to bring Binged.it to the attention of his Twitter followers. 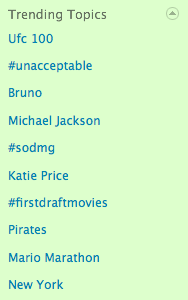 Duplicating Twitter Accounts To Drive Page Views? I noticed a bunch of funky Retweets yesterday in my Twitter account. However, they weren’t true Retweets because each were constructed with RT @ -timcohn which effectively deletes an original Retweeter from appearing in the Retweet stream. Each account had a woman’s name along with an attractive picture. Each account also had the exact same number of Tweets (1952). Although I have an idea why Retweeters may be stripped from a Retweet Stream, I have no idea why someone would take the time to duplicate a bunch of Twitter accounts and then send traffic to a wide variety of non related non montizeable sites. The fifth year of the Web 2.0 Summit was held in San Francisco over the last several days. This year the Web 2.0 conference theme was Web Squared. We believe that nothing is going to get better if the world collectively hides under its desk. It’s time for the Web to step up and step into its role as a platform for positive change—be it in our economy, our culture, or our society. Last year we focused on where the Web met the world. This year, the Web is the world. And we’ve got a lot of work to do. Entire industries are in the process of painful rebirth—finance and energy, to be sure, but also information technology, media and communications, healthcare, retail—nearly every major sector, in every major region of the world. And while these changes have been ongoing for more than a decade, the global financial crisis has accelerated and clarified this shift. It’s the end of one era, and the beginning of another. At the center of both the destruction and creation is the World Wide Web. For this year, we are focusing on demonstrating proofs: showing how the founding principles of Web 2.0 have been put into practice to address the world’s most pressing problems. Although I wasn’t able to attend in person this year, I have captured all of the Tweets that came out of the conference and posted the Top 50 Twitter Tweets (in no particular order) I found most insightful below. RT typos – can’t edit multiple Tweets? RT@alparker To teen panel at #w2s Q: “If Bing paid you to search, would you use it?” A: “Oh, yeah!! !” But would advertisers continue to? RT@ptoboley Hurrah for Twitter! RT @RodCrawford: Teens don’t use Twitter #w2s #web2 – …because it requires thinking. @benphoster Teen Panel at Web 2.0: Not a single kid could name the company behind Bing #w2s Maybe that’s good for MSFT. Have the television viewing habits of teens decoupled from regular televised programming? RT@dberlind Sir Tim Berners-Lee @ #w2s: One of the gating factors for the whole world of Web apps to take of is trust. RT@rlavigne42 @stumm :17 cents of every dollar in health care spent on billing. –Aneesh Chopra #w2s A simply astonishing number. What problem couldn’t you solve if spent 8 hours a day of concentrated effort focused on solving it? I have posted over 16,000 words 140 characters at a time to Twitter since I began Tweeting in May of 2008. Recently I became concerned about the Twitter cloud’s ability to archive my Tweets for a prolonged period of time. I don’t have the same concern about WordPress’ ability to archive my blog posts so I thought I would mash the two together to create a searchable archive of my Twitter updates both here in my WordPress blog and ultimately in Google’s search engine results pages via the Googlebot crawl. To create a searchable archive of your Twitter updates, Go to your Twitter Updates link @Twitter.com to scroll, scrape and copy all of your Twitter Updates into a Word document or Text editor. Then create a new blog post in your WordPress blog and paste all of your Tweets into a post with or without each Tweets hashtag (#). Once you have published your Tweet post in WordPress, visit your blog and search for any of your Tweets by date or keyword in your WordPress search box. Your Twitter updates are now archived within WordPress. Provided your blog is already in the Google index, your Twitter updates will then soon be locatable within Google search engine results pages too. 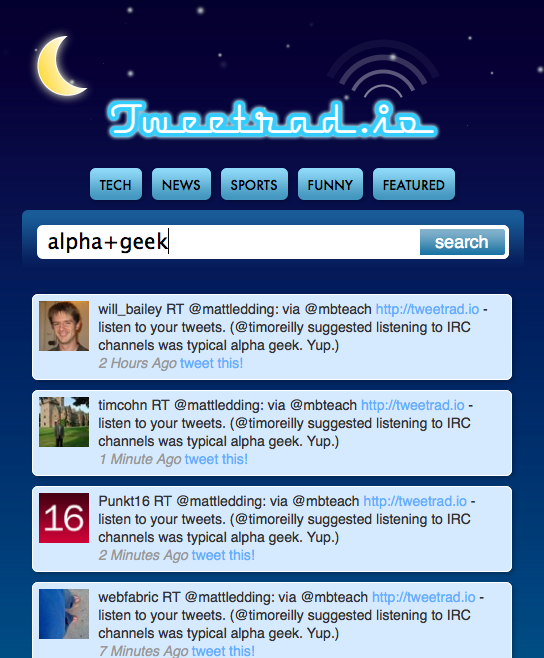 I have posted an example of searchable Twitter Updates on my personal blog @TimothyCohn.com. Who Owns Your Tweets? You or Twitter? There have been several posts in the last day or two about who owns a Twitter account – the employee or the employer. Q: Who owns the Twitter account? At which point I have commented: Yeah – and because Twitter owns all Twitter accounts don’t they also “own” all the content you have posted on it? 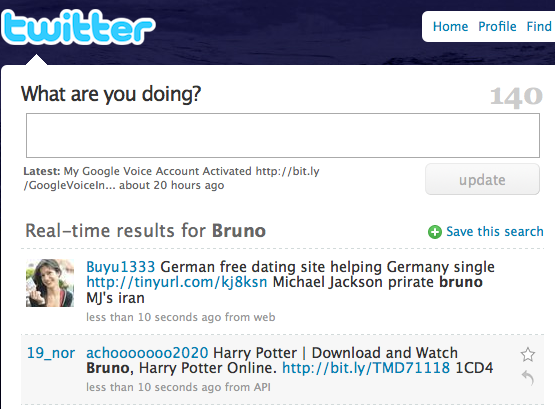 While Seo Writer’s answer appears to be the correct one, I think it also begs the question “Who Owns Your Tweets? You or Twitter? Maybe someone over at Twitter could help answer this question if they haven’t already. The Sunlight Foundation has established and interesting model for any government that may be considering a transparency initiative called Capitol Tweets. What government couldn’t better serve or be served with a Twitter based real time communications and service model? 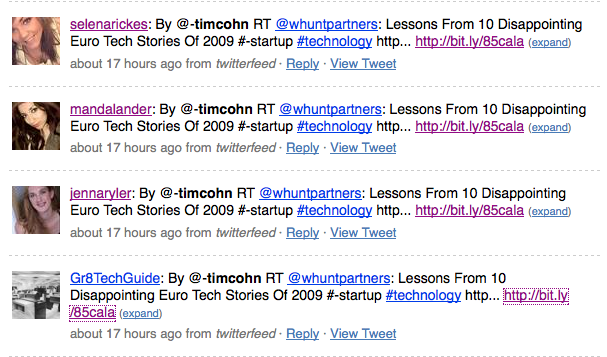 Today I noticed referrals to my WordPress blog from TwitterVision.com. Its an interesting concept: mashing Twitter Tweets up with Google Maps. I am not sure how often it grabs Tweets or how regularly specific areas within Google Maps are refreshed but TwitterVision does provide a new view into the world of Twitter. I tested Twittervision’s ability to place and map Tweets originating from the San Francisco area. After several minutes Twittervision reported a Tweet from one of Twitter’s most prolific Tweeters – Robert Scoble @ Half Moon Bay, CA.